Cilantro The Cooks Shop is a family owned-and-operated cookware, bakeware, and kitchenware retail store serving the community of Lunenburg, Nova Scotia and Altantic Canada. The one-stop-shop for chefs and cooks of all skill levels. 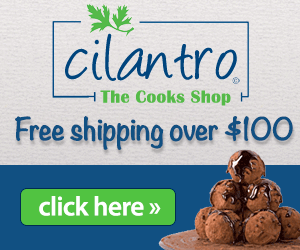 We're confident you'll find something interesting both in our store and when browsing our website, www.cilantrocooks.com. In fact, Cilantro carries all kinds of products: essential kitchen utensils, pots and pans, cast iron cookware, espresso machines, gourmet food and chocolate, local artisanal Nova Scotian and Canadian made products, as well as international bakeware, cookware, and kitchenware brands.